We were located on FSB C2, right on the edge of the DMZ. We were close enough that, if I had a BB gun, I could have shot BBs into the DMZ. This was the last American combat unit in northern I Corps and, as the war was shifting to Vietnamization. (Yeah, we know how that worked out!). Getting supplies other than the 175mm projos and powder, was often difficult as the Americans retreated further south and the convoy drivers had a longer relatively unguarded or protected route to reach us. We needed some key items. Like...heavy timbers to cover our asses when the guys on the other side of the DMZ got fresh ammo for a few 240mm mortars. We had heavy bunkers alright, but not heavy enough to withstand a 240mm. One of the gun chiefs suggested that we take a few guys, go down to a construction battalion [he knew where it was] and "requisition" a truckload or two of more of the big beams needed to reinforce our bunkers. He said the hydraulics on the 175mm guns would be able to lift a timber. I believed that! I was all for it. I knew nothing about construction but agreed to lead a team to find the trucks and timbers. Leaving around noon, we got to the construction battalion motor pool after 1700hrs in time to see one truck already loaded with timber and another mostly full. There they were...lowboys, loaded and ready to go. God was definitely on our side. One of the NCOs talked to the two guards, keeping them busy, while a couple of the men drove off with their trucks. I still don't know how we got away with that one since anyone flying in to see us at C2 could clearly see two lowboys parked off on one end of the position, mixed in with our 5 ton ammo trucks. We got 2 or 3 water trailers the same way but this time, we victimized a US Marine detachment located about halfway between our position and DaNang. Again, the trucks were parked right in the open.....and no one said a thing. 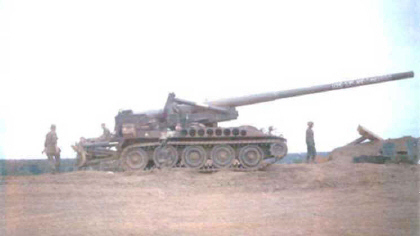 Eventually, we were ordered to vacate the position and turn our guns and other battery equipment over to a newly-constituted Vietnamese artillery battery. I don't think any single man wanted to stay there - the nearest US combat unit was more than 4 hours away, assuming the road was clear and open. But I was amazed at the loving care and proud polish each crew member of "C" Battery, 1/39th FA, did on their gun before getting ready to leave forever. We were crazy cannoncockers for sure!